So far, so bloody good. The job itself is pretty cushy, delivering to big Bookers/ Makros or whatever. These tend to be on industrial estates with lots of easy access. Then all you do is pull your curtains to let them get the pallets off the side of your trailer or jump on the back with a pump truck and move the pallets to the end for the fork lift to take off. The easiest option is when they have a proper dock so you just back up to it and they unload you, but they are not that common. Then it’s usually go to a relatively local factory or warehouse and pick up a load to take back to Haydock. They treat the drivers really well as well. On the curtain sided trailers they have a security cord that fits through all the fastens along the curtain, so you can’t open it. I went to one place, they said to open my curtains, so I pulled the cord through, looped it up on the catwalk between the cab and the trailer and pulled my curtains. Then they said to reverse into the bay area. Which I did. Then realised the catwalk is part of the cab, the cord is attached to the trailer, there was a lot of movement, the cord got snagged and snapped. The downside to the job is the shift length. Either a bare 8 hours, or like last week, 15 hours, 13, 12 etc. I have been struggling trying to get to karate or do runs. I have talked to two drivers who are full time, probably they have been dragging the job out and grabbing (which I can’t get my head around. If you can go after 9 hours, I’m gone) but one of them said he made 45K last year, the other said 50K. This was in front of other drivers, so I don’t think they were bullshitting. For the full timers it’s something like £12 per hour days, plus 20% after 18.00, 25% after midnight, I think one of them said it was time and a third for overtime, time and three quarters for working your sixth shift. If you were doing a 60+ hour week that would soon add up. The agency have been doing what I want as well. I asked for mornings, the latest I’ve started was 10.30 I think, earliest was 05.30. Pretty much dead what I asked for. Today I asked if I could do regular Sun-Thurs, they said OK. Sent me a text saying work has been pretty slack at Bookers this week (I’ve been in all week, so didn’t know) but they’ve been giving me priority as Bookers ‘like my work’. Cool. I’ve not been there five minutes but someone’s noticed me. Last weekend I thought I’d try a hill run to strengthen my legs. Whilst looking for the address of a killer hill in Bolton (Winter Hill, a three mile ascent to the tallest hill in the Pennines – thank you Wikipedia-) I noticed the Bolton Hill Marathon has moved from the unbelievably bitter March timeslot to June. I entered there and then. Then went for a run. My first hill run in years. I was dying within 2 miles. I ascended 2,000 feet on the run, most of it in the first 6 miles, and my legs were dying. I was wearing my lungs externally. I was determined to do at least a half but even that was nearly too much. I got a bit of focus back and managed to force out 15 miles, but it was pure misery. Still, I’ve got 6 weeks until the marathon. No pressure. On top of work and trying to fit in karate I have a further hurdle to overcome. I’ve come down with a parched throat (at first) then tickle and dry cough and feeling lousy. So that’s super. I’m calling it Bulgarian Plague, even though Lisa hasn’t got it, as I came down with it a few days after meeting my mam, who is fresh over from that well known Euro plague pit. Right, I’ve had an hour, must be bedtime. 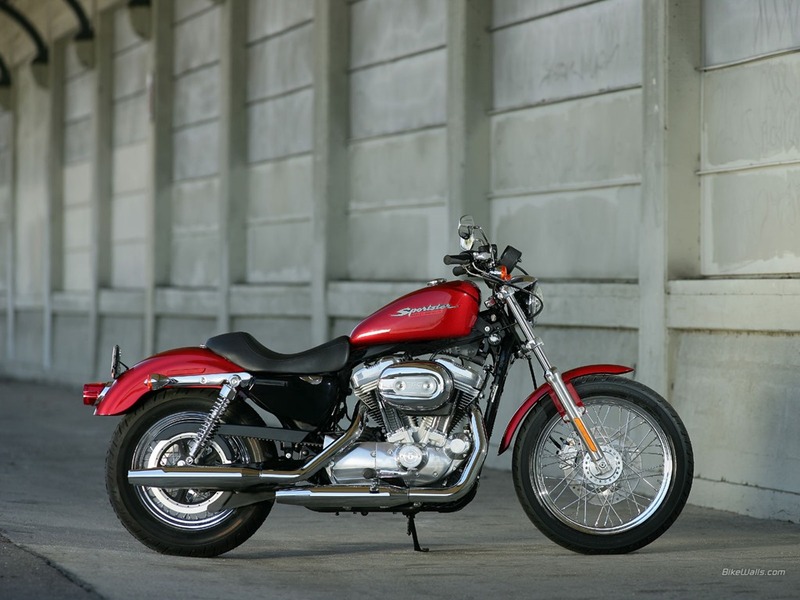 I’ve had my sights set on a Harley Davidson Sportser, just the ‘baby’, the 883 CC one. As you can see, very pretty. 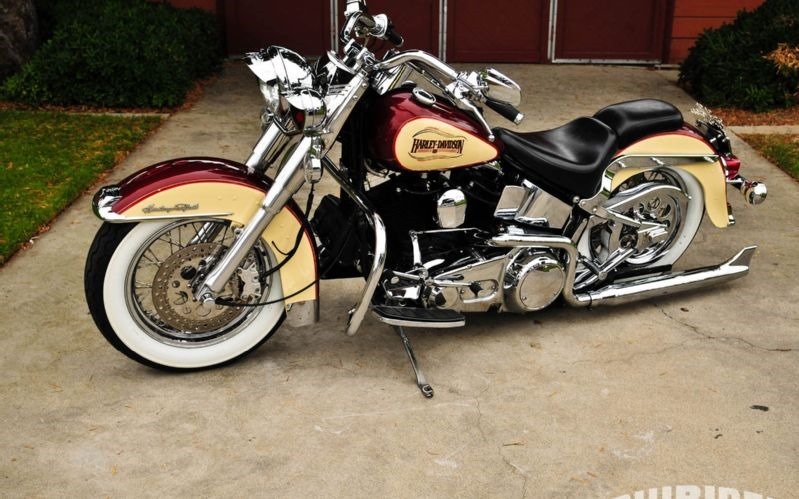 It was to be a stepping stone then in a few years move up to the Harley I really want, the big Heritage Softail. Obviously the last word in practicality and knee-down performance with that ground clearance. Surprisingly cheap, starting at around £6- 7K. Well, it surprised me, I thought they were over £10K even old. 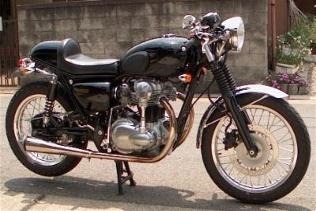 I have had my head turned, again, by that Kawasaki W650. 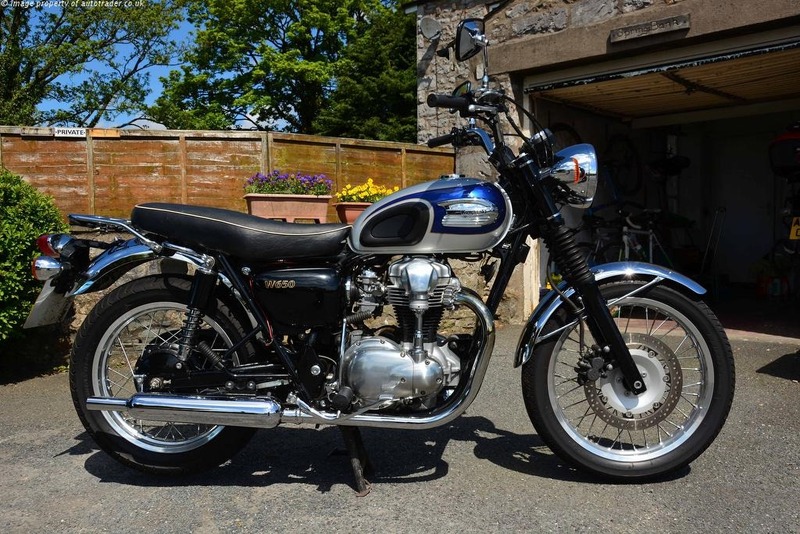 A retro bike in the style of it’s 60’s predecessor, the styling of which was in turn ‘influenced’ (stolen wholesale) from the Brit twins of the time. Just zoom in and marvel at it’s beauty. The peashooter exhausts, the kick-start (kick-start! Ha!) The faux pushrod covers (silver tubes up the side of the engine) the fork gaiters, the finned, air cooled engine, the tank knee pads, the drum rear brake, the absence of plastic. It is a work of art. They are not without their own charm, just not what I’m after. They may look as ugly as sin, but ridden right no-one will ever know. Told you I was obsessing. Then, as if that wasn’t good enough, it lends itself perfectly to being ‘cafe racer-ed’. 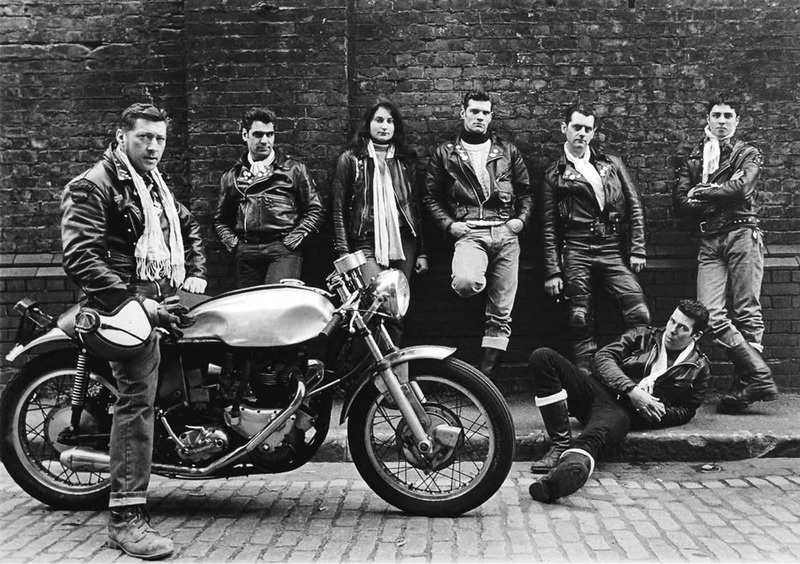 Cafe racers were a 50’s/ 60’s thing. At the time, I’ve read, the working man couldn’t afford a car so had to get a cheap bike for running around. These mostly had the sit-up-and-beg riding position of the one above. When people wanted to make them into boy-racer machines on the cheap (to race their mates when they met in the biker cafes) they simply put ‘clip-on’ (dropped, racing style) handlebars on so they could lay over the tank to reduce drag, they moved the foot controls to the back (rearsets) put a 2-into-1 exhaust on (to lose weight) ditched the fat knacker off the back and put a single seat on. Job done. Your pedestrian Volvo estate turned into a smoking hot-hatch Golf. *That*, my friend, is a cafe racer. And it’s the Kwak W650. That transcends beauty, it is sublime. Simple, elegant, clean lines, the perfect modern retro cafe racer. Everything now is a means to that end. Just re-reading this. I should point out it’s purely an aesthetic thing. It looks beautiful. If you want to go fast you need the aerodynamic plastic and a different engine. 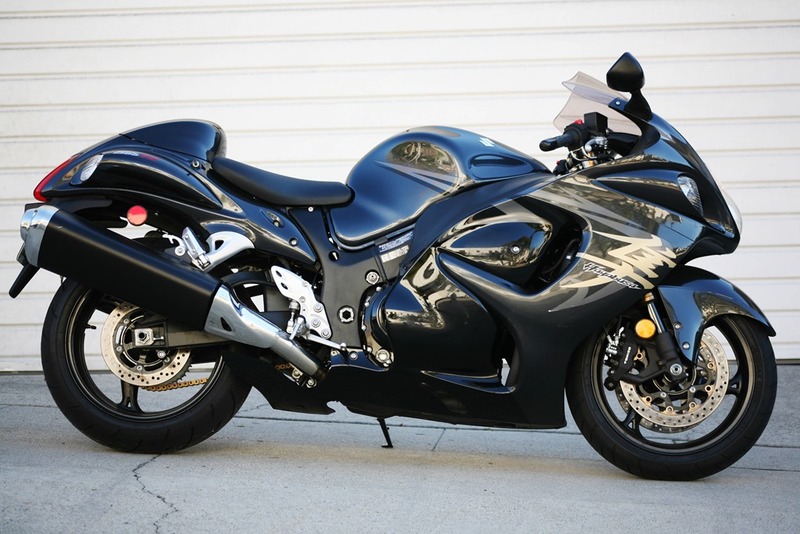 I refer you to the Hayabusa. This is just for pottering around thinking you’re a 60’s rocker on his way to the Ace Cafe. A final point I suppose I should mention; Wendy is intractably opposed. Not out of innate git-ishness (as I supposed) or because I selfishly want to blow the best part of four grand of our money on something she’ll never use and I might be chucking down the road, but because she thinks I’ll kill myself. I think I’m old enough now to ride sensibly. If I’m not and I start getting points then the bike has to go, I can’t lose my job. Nowadays I read the road and am far more aware of things that are going to happen then any car driver. I see situations before they happen and anticipate other people’s reactions way before they’ve even noticed. And if someone does kill me on the bike, well, you’ve got to die of something. I don’t drink, smoke or do other drugs, I want something fun in my life or what’s the point?